Today, we celebrate the Solemnity of the Sacred Heart of Jesus. I have always had a devotion to the Sacred Heart, the heart of the shepherd who loves us deeply. The devotion to the Sacred Heart is not one devotion among many, but the devotion from which all devotions ought to flow. The Sacred Heart is Christ himself, divine and incarnate. In the words of the Holy Father Pope Benedict XVI, the devotion to the Heart of Jesus is as old as Christianity itself. The pierced Heart of the Crucified speaks a word of compassion to all of humanity. That word was carved out in the flesh of Jesus by the lance of the Roman soldier. God's word of compassion as expressed in the Sacred Heart is an invitation for every Christian to feel and to think like Jesus. The Heart of Jesus thirsts for souls to open up to Him. This is highlighted by the words of St. Francis of Sales, which were later appropriated in a new way by Blessed John Henry Cardinal Newman: cor ad cor loquitur – heart speaks to heart. 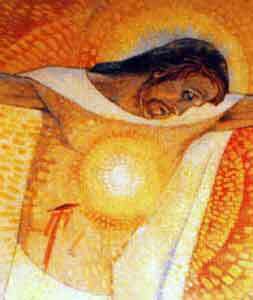 The pierced Heart of Jesus desires to speak to our hearts that we might enter into a deeper communion with Him. Jesus offers His Heart to us, and He desires that we offer our hearts to Him. The Sacred Heart manifests God's boundless and passionate love for us. Through his pierced Heart, Jesus invites us to see that the only way to live our faith is by becoming self-offerings, by opening our hearts completely to God and to our brothers and sisters. Jesus, who is meek and humble of heart, shows us that our Christian vocation is to love and to serve. Love and service manifest the meaning and purpose of every human being. In the Heart of Jesus, we come to know and to understand more deeply the love of God for us. As we draw near the Sacred Heart, we draw near the very meaning of our human lives. This is echoed by the words of the blessed John Paul II, "...near the Heart of Christ, the human heart learns to know the authentic and only meaning of life and of its destiny, to understand the value of an authentically Christian life, to be removed from certain perversions of the heart, to unite filial love of God with love of neighbour." The Heart of Christ reveals to us the way God loves us. This Heart reveals the self-giving love of God for us – agape – for he desires our good and salvation. 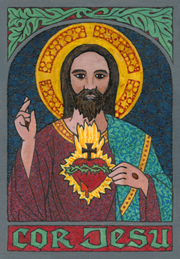 The Sacred Heart also reveals God's longing for us, how much He thirsts for the love of every one of us – eros. In knowing that God's love for us is both agape and eros, both self-giving and longing, we are called to recognize our vocation to be agents of charity and seekers of God in all things. In calling us to be agents of transformation and seekers of the divine in the world, Christ invites us to offer our hearts for the salvation of the world. In that process, our hearts are purified, recreated, and our self-giving and our longing are purged of selfishness, pride, lust and cupidity. Through the devotion to the Sacred Heart of Jesus we learn to live more Eucharistically, to offer ourselves to God for His purposes each day. By offering our joys, sorrows, prayers and words in union with the holy sacrifice of the Mass, our hearts are made like unto the Heart of Jesus: we learn to feel like He feels, to see like He sees, to be informed and guided by the same Spirit who drove Him to the desert. Two powerful avenues or spiritual ways to live this offering, to live the devotion to the Sacred Heart, are the morning offering, as proposed by the Apostleship of Prayer, and the personal consecration to the Sacred Heart of Jesus. I personally invite you to consider these spiritual ways as a form to know, experience and witness the love of God for the world.